Build up cohesion between team members to create a stable and pleasant work environment: such is the goal of corporate events. And the reason why companies are so fond of events such as team-building, seminars and incentives. At the Chartreuse de Pomier, between Annecy and Geneva, you will find a whole host of options to organize the corporate event of your dreams. Ideally situated between Geneva and Annecy, the Domaine de la Chartreuse is a historic site where nature plays a key role with its forests, fields and cliffs. •Take off in a helicopter from our DZ and be set down on the top of Mount Salève for a mountain bike descent. You can enjoy your activities in the many parks and gardens surrounding the Charteuse in a unique setting, or choose our indoor solutions. You’ve got it: this building will allow both you and those you work with to spend unforgettable evenings and team-building sessions at the Chartreuse de Pomier. 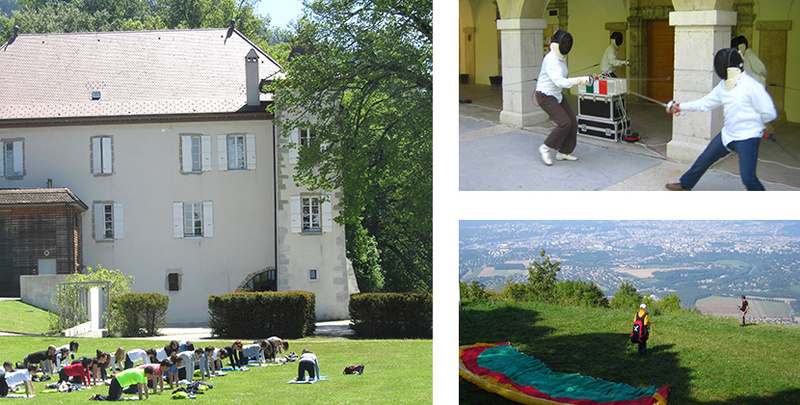 Choose the Chartreuse for your corporate team-building sessions between Annecy and Geneva. For your incentive seminars, the Chartreuse de Pomier situated in Haute-Savoie offers you the possibility of enjoying an energy-boosting and team-building day with your teams, either indoors or outdoors. Why not choose one of our many forest workshops for cohesion & team-building moments? We work with professional coaches and can offer you a solution tailored to your needs. To round off your incentive evenings in style, you can organize in the Medieval Cellars or under the marquees, a gala evening with DJ, band, concert, etc. Let us put you in touch with our partners or organize it for you. We’re not short of inspiration or experience where entertainment is concerned: why not add extra cheer to your evenings with an introduction to wine-tasting, a Murder Party, a wine-based casino, to name but a few options. Really, there’s nothing better for encouraging discussions and conviviality and for federating your teams!